Will I See In The Dark? Growing carrots is easier than some people think, and growing them in containers is not impossible. In fact you can now buy carrot seeds that are specific to container growing because they are short and stumpy but wider than your average ‘ground grown’ carrots. The most important thing to remember with any root vegetable is that they hate being moved, because of this you should never start any rooties in one place, and then move to another when they get bigger. Where you sow, is where you will grow. Soil. 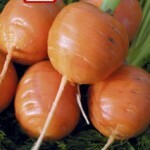 Carrots like a sandy soil so that they can move easily in their ‘home’ while they are growing. They, like other rooties, are also thirsty all the time. The best way to check if your little ones need watering is to dip your finger into the soil (away from the veggies) to about your 2nd knuckle and see if the ground is dry. If it feels moist, leave well alone or you will cause splitting. If, like me when I started out, you struggle to make your home compost because you have a concrete yard and no space what so ever for any size composter then you will probably buy what you can afford from a high street store or supermarket or DIY shop? There is nothing wrong with this at all. 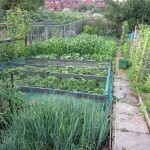 Whilst you might not grow prize pumpkins or ginormous cucumbers, you can still grow practically anything else. Now, this is where contradictions will occur – watering. Personally, I prefer to sit my container in a tray of water so that it can soak up as much water as it wants. This way the water is coming from underneath not on top to encourage root growth. As well as this, water from the top runs the risk of pushing all those tiny seeds to the edge of the container instead of where you just put them. Pests? 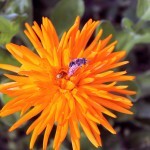 Oh yes, there is one pest that is the bane of the carrots existence… Carrot Fly. One thing that you can do to really annoy carrot fly is keep your container high up or use a high sided container. They can only ‘jump’ around 2ft, so anything over that should be safe. But be warned… when you pull that first carrot out of the ground, these little bugs can smell it from miles away and every carrot fly in the neighbourhood will soon be on your doorstep and wanting to devour your prized carrots. I always plant French Marigolds as close to my carrots as possible, as these can also deter carrot fly because their scent overpowers that of the carrot, you can read more about Companion planting here. Good Luck and Happy Growing!